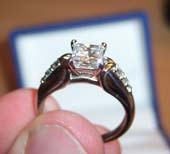 I began making plans and shopping for a ring back in the spring of 2006. After looking at the hefty price tags, I knew that something drastic needed to happen to get this to work. I sold my truck in May to raise some extra cash and went the entire summer with no wheels. By the end of the summer, I knew all I ever wanted to know about diamonds. The 4 C's were in my back pocket. On a trip to Monterey, a coastal town in California, I asked Nicci's parent's for their approval over a cup of coffee. Their answer was an overwhelming 'yes'. I had known for a few months that I had a business trip to Nepal in October and Nicci had agreed to join me. I came to the dumbest and best decision to bring the ring with me through all the security checkpoints, airports, plane trips, and hotel stays throughout third world Asia. When we arrived in the beautiful mountain resort town of Pokhara, I arranged to hire a boat for a sunset float on Lake Phewa under the Himalayan peaks of Fishtail and Annapurna. The second I reached into our pack to grab the ring, Nicci began crying and the rest is history.